While imaging tests and tissue biopsies are the most common methods for diagnosing mesothelioma, blood tests can also help doctors identify the disease. These blood tests look for certain indicators of disease, known as biomarkers, in a patient’s blood. Dr. Snehal Smart of Asbestos.com talks about the MESOMARK assay. The MESOMARK assay measures the quantity of SMRP (serum-measured soluble mesothelin-related peptide) in a patient’s blood serum. An assay is a test performed in a lab. Abnormally high SMRP levels may indicate the presence of mesothelioma, sometimes years before an asbestos-related cancer diagnosis is made. However, because some types of mesothelioma tumors, such as those from sarcomatoid mesothelioma, do not release high levels of SMRP, the FDA recommends that doctors combine the MESOMARK assay with other tests to ensure an accurate mesothelioma diagnosis. Because of this limitation, insurance companies may restrict reimbursement for this particular test. Nonetheless, elevated SMRP levels may be closely associated with patients who have had asbestos exposure and who are therefore at a high risk for developing mesothelioma in the future. The SMRP assay is a tool to assess cancer response to treatment and cancer progression. An elevated SMRP tumor marker is a helpful laboratory test to help initially diagnose mesothelioma. However, an elevated SMRP level is not purely restricted to mesothelioma. Other malignant diseases, such as pancreatic cancer, ovarian cancer, and primary lung cancers, may produce an elevated SMRP level. In a study of 1,086 blood samples, 99 percent of the healthy specimens displayed SMRP levels at or below the reference value used to indicate the presence of an asbestos-related cancer. The MESOMARK assay is completed in two steps. First, the doctor takes two small blood samples from the patient’s vein. Each sample contains about two teaspoons of blood. The doctor then sends the samples to a laboratory for official analysis. The patient is free to go home after the procedure, and is generally not at risk for any significant side effects. At the laboratory, technicians add several antibodies to the blood samples that bind to the protein fragments. They then stir the mixture and place it in a laboratory instrument called a plate reader. Computer software analyzes the contents of the blood sample and provides a measurement of the amount of SMRP-bound antibodies present. SMRP levels at or above a certain reference point may suggest the presence of mesothelioma or another malignant pleural disease. Elevated SMRP levels can also be used to identify asbestos-exposed individuals who do not yet have the illness. This implies that blood tests could someday serve as a screening tool for patients at high risk for developing asbestos-related cancer in the future, but most studies suggest the results are not yet reliable enough. In one study of 40 subjects with a history of asbestos exposure, seven individuals displayed elevated SMRP levels. Within five years of the blood test, three of these patients were diagnosed with the disease. 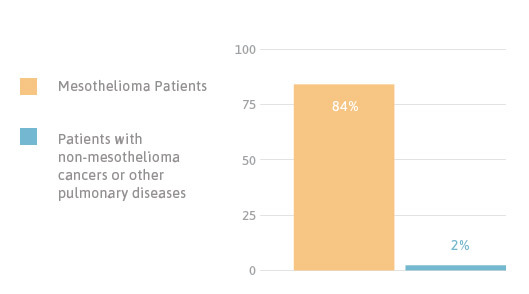 None of the 33 patients with normal SMRP levels developed mesothelioma in the next eight years. Created in Japan, this blood test detects a form of mesothelin known as N-ERC/mesothelin. This test is similar to MESOMARK in its design, but uses a specially designed enzyme test to increase accuracy. The N-ERC/mesothelin test is 95 percent effective at detecting mesothelioma, but only 76 percent effective at ruling it out. 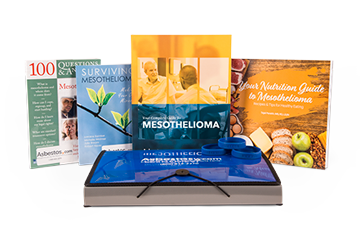 Even though this test is more accurate than MESOMARK, it cannot serve as a single test to diagnosed mesothelioma because mesothelin is produced by other cancers than mesothelioma. The N-ERC test is more accurate at detecting epithelial mesothelioma than sarcomatoid. This is because epithelial mesothelioma produces more mesothelin than the sarcomatoid cell type. Fibulin-3 is a protein overexpressed by mesothelioma and found in pleural fluid and blood. Mesothelioma specialist Dr. Harvey Pass helped pioneer the fibulin-3 test for mesothelioma. In 2012, he co-authored a study that found fibulin-3 96.7 percent effective at detecting mesothelioma and 95.5 percent effective at ruling it out. Pass also reported that when used to detect pleural mesothelioma among asbestos-exposed persons, the fibulin test had 100 percent sensitivity and 94.1 percent specificity. However, when the test was used on archived blood serum samples from mesothelioma patients, it was not as accurate. Other studies found fibulin-3 slightly less effective, which could be explained by variances in the patients studied. For example, an Egyptian study found the test 88 percent effective at deciphering pleural mesothelioma from other cancers that had spread to the pleura. They also found it 100 percent accurate at discriminating malignant mesothelioma from benign pleural effusions. A 2014 Australian study found mesothelin superior to fibulin-3 at detecting mesothelioma, but found fibulin-3 had more prognostic value than mesothelin. Bigger studies and more research are necessary to determine the diagnostic and prognostic value of fibulin-3. Some other laboratory blood tests screen a patient for osteopontin and megakaryocyte potentiation factor (MPF). Levels of these biomarkers are also significantly higher in the blood of mesothelioma patients compared with healthy individuals or patients with other cancers. Laboratory technicians measure these biomarkers in the blood with a method known as enzyme-linked immunoabsorbent assay (ELISA). Osteopontin and MPF blood tests are not quite dependable enough to make an official diagnosis. Osteopontin and MPF lack specificity as diagnostic markers, meaning there is not a high enough likelihood that a positive test result truly indicates a patient has mesothelioma cancer. However, the blood tests that rely on these biomarkers can play a significant role in monitoring the disease. Osteopontin is a type of protein that controls cell adhesion and bone-matrix interactions. Levels of this protein are elevated in mesothelioma patients — even when compared to patients with benign asbestos-related conditions like asbestosis and pleural thickening. As a result, osteopontin is a reliable biomarker for differentiating between healthy asbestos-exposed individuals and those who have developed mesothelioma. Some studies suggest that osteopontin blood tests can even reflect the duration of a patient’s asbestos exposure. Other diseases that can elevate osteopontin levels include lung cancer, colon cancer, breast cancer and tuberculosis. In a study exploring the potential uses for mesothelioma biomarkers, osteopontin was the only blood-based biomarker unable to differentiate malignant mesothelioma from other cancers. However, it did prove useful for screening asbestos-exposed populations, monitoring treatment and predicting prognosis. In one study, patients with a high serum osteopontin level experienced significantly shorter survival rates than patients with low serum osteopontin levels. Patients with more than 350 nanograms of osteopontin per milliliter of serum had a median survival of five months, while patients below this threshold had a median survival of 15 months. Blood analysis tests can also identify the presence of megakaryocyte potentiation factor (MPF), a soluble protein produced by another mesothelin precursor protein. Doctors do not fully understand the biological function of MPF, but they do know it is released into the bloodstream of mesothelioma patients in extremely high quantities. In one small study, laboratory technicians identified MPF in the blood serum of 91 percent of late-stage patients. They did not detect MPF in the blood of healthy donors. Ovarian cancer and pancreatic cancer can also produce elevated MPF levels. In the same study, researchers measured the MPF levels of four patients before and after mesothelioma debulking surgery. In two of the patients, MPF levels decreased immediately after surgery. In one patient, surgeons could only remove 10 percent of the tumor, and post-surgical MPF levels did not significantly change. This indicates that MPF blood testing can help monitor a patient’s response to surgery. While mesothelioma blood tests show great potential for diagnosing the disease and predicting its outcome, researchers are working diligently to improve the reliability of their results. These tests could one day provide doctors with a low-cost, minimally invasive method for diagnosing mesothelioma, but only after researchers uncover ways to improve their sensitivity. When a person is exposed to asbestos and the fibers enter the body, damage begins to occur. The byproducts of this process can be used to detect the beginning changes of cancer cells. Biomarkers of exposure are present in the body after asbestos is inhaled. Doctors can monitor these and other biomarkers to potentially track the progression of disease. 8OHdG is a biomarker for oxidation (cellular damage) and is often found in the body during the early stages of cancerous cell development. Elevated levels of 8OHdG have been found in people occupationally exposed to asbestos. It has also been linked to asbestosis. The 8OHdG compound is created as when asbestos damages cells, and it can cause DNA mutations. Researchers suspect that in this way, 8OHdG plays a role in the development of mesothelioma. This biomarker is produced by many cancers, not just mesothelioma, which means it can’t serve as a clear indicator for one type of cancer. Additionally, exposure to cigarette smoke and heavy metals can create 8OHdG, not just exposure to asbestos. However, levels of 8OHdG correlate with asbestosis, meaning that higher levels of the biomarker are present in advanced cases. One study found the combination of 8OHdG, VEGFbeta and SMRPs effective at identifying people with varying degrees of asbestos exposure, which could help identify persons most at risk of developing a related disease. This is a marker of asbestos exposure. It cannot distinguish between an individual exposed to asbestos with mesothelioma or without mesothelioma. In some studies, the levels of PDGF in a patient’s blood correlated to a higher or lower survival. Patients with a lower level survived on average six months longer than patients with high levels, but these results were not as accurate when adjusted for age, gender and platelet count. While ER-β is not used to diagnose mesothelioma, it could have prognostic monitoring value. Studies revealed that patients with higher levels of ER-β in pleural tissues survived longer than patients with low levels. ER-β is normally found in healthy pleural (lining of the lungs and chest cavity) tissue. A 2014 study found that when activated, ER-β sensitized pleural mesothelioma cells to cisplatin chemotherapy. This means ER-β could improve treatment results of chemotherapy in some patients. Like ER-β, EGFR is activated by asbestos exposure and may play a role in the development of mesothelioma. Because EGFR is produced by a variety of cancers, it cannot be used to diagnose mesothelioma. However, it may be useful in monitoring response to treatment. EGFR is overexpressed in 60 to 70 percent of mesothelioma tissue samples, and it is more commonly expressed in epithelial cell types. Unlike ER-β, the presence of EGFR in patients was related to shorter survival. A team of German and Australian researchers is working on a test that may help diagnose mesothelioma using the biomarker calretinin, according to a 2017 study published in the journal BMC Cancer. They developed a test to detect calretinin in blood serum and plasma samples and found it performed similarly to mesothelin. The test doesn’t help diagnose sarcomatoid mesothelioma, but it may help diagnose epithelioid and biphasic mesothelioma. Hassan, R., Schweizer, C., Lu, K. F., Schuler, B., Remaley, A. T., Weil, S. C., & Pastan, I. (2010). Inhibition of mesothelin-CA-125 interaction in patients with mesothelioma by the anti-mesothelin monoclonal antibody MORAb-009: Implications for cancer therapy. Research Advocacy Network. (2010). Biomarkers in cancer: An introductory guide for advocates. Tannapfel, A. (Ed.). (2011). Malignant mesothelioma: Recent results in cancer research. Berlin: Springer. Washimi K, Yokose T, Yamashita M, Kageyama T, Suzuki K, et al. (2012) Specific expression of human intelectin-1 in malignant pleural mesothelioma and gastrointestinal goblet cells.